Suitable for caravans, water tanks, boats etc. 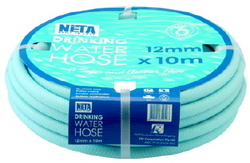 This hose complies with AS/NZS 4020 'Testing of products for use in contact with drinking water'. Pressure Rating PN12.5 - suitable for temporary connection to mains water supply.